We left camp at around 10 o’clock in the morning. There was almost no wind but it was very cold. I was ready before Magnus, but I couldn’t wait around for him because I was freezing my toes of, so I set out by my self up the Autobahn. 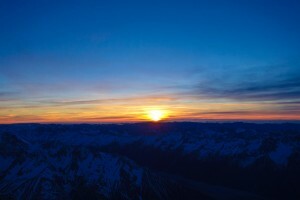 I was racing for the sun that was shining half way up the face as I could hardly feel my toes. I had passed a group of climbers just above the bergschrund and could not see them anymore when I arrived in the warmth of the sun. It was still really cold, but nothing like in the shade further down. I sat down on my backpack and took my ski boots of to warm my feet and wait for Magnus. He caught up in a few minutes and then we continued to Devils Pass where we met a nice party climbing the mountain from the other side. They had a really cool adventure biking in to the mountain from the other side, then doing a full traverse, descend the normal route and next hike down to the big river where they floated back in small rafts all the way to Talkeetna. We kept on ascending the route without being to stressed and were enjoying our time on the mountain. 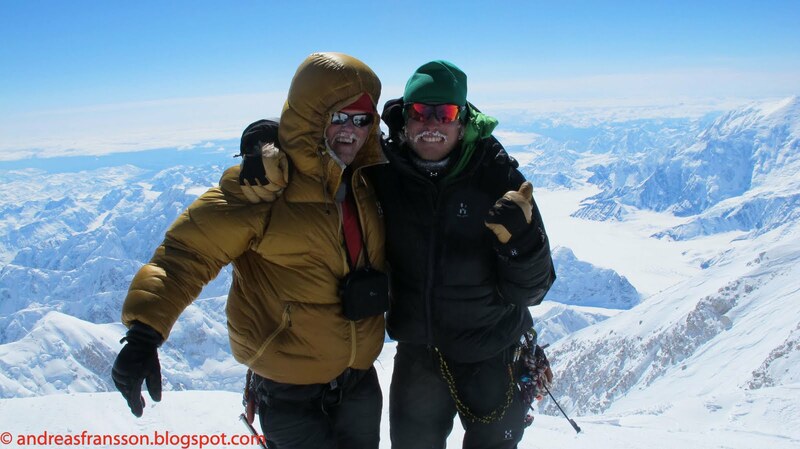 At around 2 pm we got to the summit and I became really happy on discovering the conditions up high. The hard wind the week before had not ruined the conditions too much (I would discover it had further down) and the weather was stellar and actually pretty warm in the afternoon. I didn’t want to waste too much time on the summit, because I was guessing that it could take a while to get down the face. Magnus had been carrying my rope and gave it to me and I gave him my extra pair of gloves and then I took of my thick down jacket and down pants. 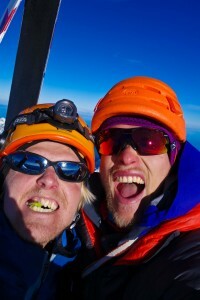 I remember asking Magnus for some water, then I gave him a hug, checked the bindings and set of down the summit ridge. I was surprised on how normal it felt skiing this high. It felt like any day in Chamonix, and even though the snow on the arête was pretty hard, it was easy to get the edges in to the snow. I met a man in a one piece down suite. He said good luck and kept on going towards his big goal. Mine were in a different direction. After the ridge I turned left on to the south face. It starts of fairly steep and the snow was as hard as snow can be and still not being ice. I could just get my edges in to the snow and was skiing really slowly and even sidestepping with the ice axe on some parts. 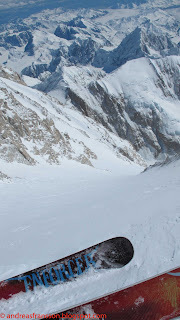 But after the first pitch the slope eased up a little bit and the snow turned in to chalk, really easy to ski. I kept at it down the face enjoying every turn and the fact that I was just being on a place few people had ever been before. At one point I stopped and caught my breath and told my self; this is not a place for human beings, this place is huge. I was skiing and skiing but the slope just kept on coming. Finally I arrived at the seracs and by traversing skiers right I could find a way trough, navigating on a little bit of ice and jumping over a small crevasse. Next I started skiing towards skiers left and the traverse, but even though it looks like a big traverse on photos the slope is leaning a bit to the left still giving a falline feel to the skiing. I crossed a few thin crevasse bridges and soon I ended up on big windslabs created by the winds, probably in the last few days before I got there. I was now quickly traversing in high speed between safe spots because the snow was feeling really hollow. I even got the infamous “whoomp” two times, and this was not, as you can imagine, a place to get a ride with the snowpack. 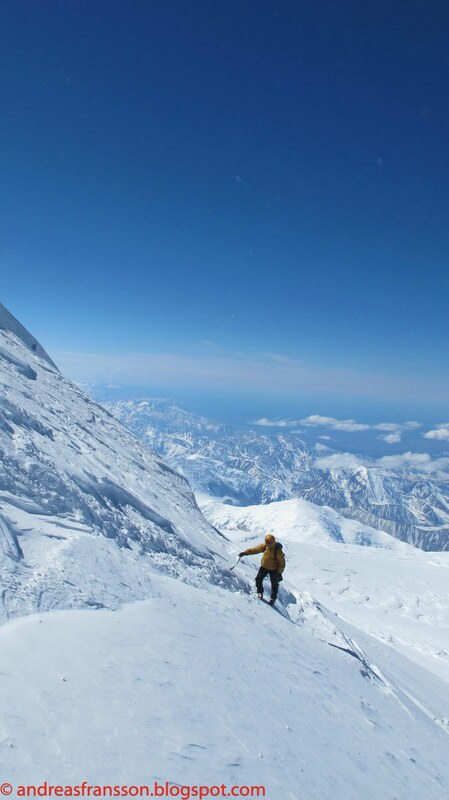 Doing something big in the ski or climbing world people is always raising their heads exposing their necks from nature’s blows of objective danger. We all just have to hope we are not unlucky that day. It’s just a simple fact. At the end of the traverse at the rocky spur I had hoped to be able to keep my skis on, but when arriving there I discovered that it was a between 50-70 degree ice and mixed traverse for a bout 50 meters. 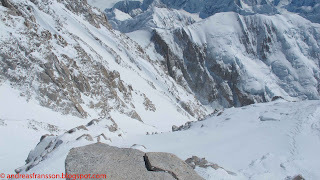 I had no other choice than change over to crampons and ice axes, put the skis on the backpack and do some ice climbing. 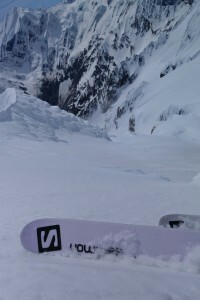 A half hour later I clicked in to my bindings and skied in to the hidden couloir. 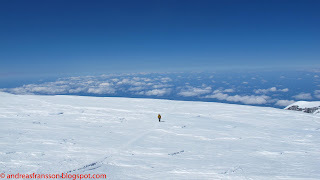 The snow got harder and harder and I only skied a few hundred meters before I had to change to crampons again. But this was only 60 meters above a big cliff so it didn’t take too much more time. 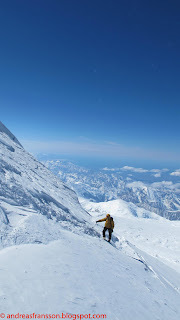 After the cliff I once more put my skis on and skied about 200m and then again changed to rappel mode. I wouldn’t ski for a while after this point but I didn’t know this yet. It was warm, really warm and the time where around 4:30 pm. A few rocks had already flown past me but it just got worse and worse. I did the first rappel over a cliff and started to have a bad gut feeling. I immediately started to search for a safe spot. Another rappel down I found one and sat down behind a rock and started to play the waiting game. For a while it was raining rocks from the sky and I felt pretty calm and happy behind my rock while the time was passing by and I had time to look in to myself as well as out on the view. 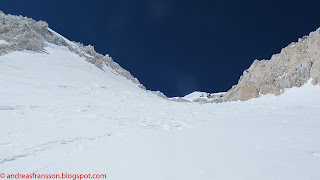 At 11 pm the situation had calmed down and I continued rappelling down a few cliffs and icefalls in the couloir. 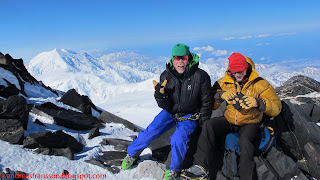 Its worth to mention that I only had one 60m iceline with me as two ropes had been out of the question because of the weight, and my Chamonix rappel line in Kevlar just take to much time in the rope work because its really hard to handle and is not good for multiple rappelling. When I got down to the face below I discovered that it was not at all in the same conditions as it had been on our recognisance trip before the hard winds. Most of it was still skiable though and I would have done an effort if it had been day time but in the middle of the night it felt a bit contrived to start skiing something that was faster to just down climb and I still had to do plenty of short rappels over ice patches and still almost every couple of minutes a rock came down the face. Priority no 1 was to get down safely. 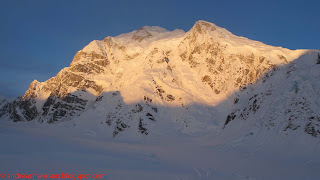 So I down climbed around 400-500m before I put my skis on on the slanting traverse above the bergschrund. There I was mostly sliding and sidestepping but it was still faster than with crampons. When I got down to the schrund I couldn’t see the bottom, it was all just a blur in the dark and I did one free hanging rappel down into the darkness and, with knots on the end of the rope, hopped I would get down before the rope ended. The bergschrund was well over 20 m and I just made it over to the other side with the rope. Continuing skiing down the glacier was not an option so I slowly skied down to the middle of the glacier, negotiating the crevasses in the bad light to find a spot where I should be safe from the rock missiles. The time was around 2.30 AM. 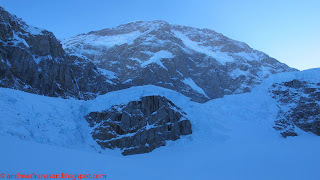 And then I just sat there, in the middle of this glacier in the middle of the night; tired, hungry and thirsty. But happy to have done what I came to Denali to do. The first thing I did was to start melting snow and to put on all the clothes I had. Then I drank three liters of water before I ate my food. The sleeping was out of the question; I was way to cold to be able to sleep. 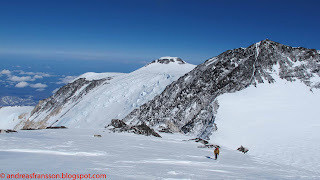 At around 5 AM I started skiing down the glacier towards the last big crux of the outing, the ice fall, a 200 vertical meter big and highly crevassed steepening in the glacier. I was hesitation quiet a bit on which way to go at first. The crevasses were really big and the bridges thin and I was walking back and forth trying to find a good way on the convex slope. Finally I remembered I had taken a zoomed in photo of the icefall on the recognisance trip so I took up my camera and started memorizing the run. 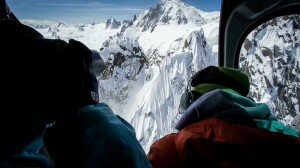 It felt like in the old days; memorizing a competition run for a freeride competition. I found one way that seemed possible on the whole face so I knew I really had to get right from the start. The snowpack was very slabby an I got “whoomps” every now and then. Skiing down the face went really well. 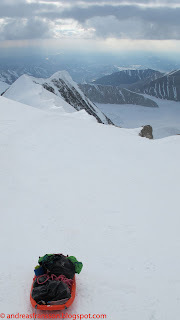 I skied fast and found my way from the start and got to straight line a wall of ice in the end; skiing in high speed out on the gentle glacier. Skiing down the east fork I knew that the hardest challenges were behind me, now I only had to keep the concentration to not end up in a hole. When an hour later finally arriving at the big track leading from basecamp to ABC I, for the first time in a while, felt safe. I skied down on the lonely track, (the climbers had yet not started out for the day) as far as I could and when it started to mount towards base camp I just did not have any more energy left. I stopped, lay down on my backpack and fell asleep. After some time passing climbers started to wake me up to see if I was ok. I told them I have had a long day and then got back to my dreams. 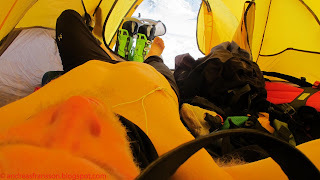 I lay there for 6 hours before I continued the last 30-40 minutes up to base camp. On arrival there I put up my extra tent and opened a pack of Pringles chips to celebrate the adventure. I had hoped that my friends Colin Haley and Nils Nielsen would be around so I could borrow a sleeping bag from them. But they where up on the north buttres of Mt Hunter and didn’t come back before early morning the next day. I got another cold night. The following day I hang out with my friends in camp. We where a tired group and spent most of the day eating and enjoying the sun. It was a great feeling having the big objective behind me and I thought that if I got to do anything else on the mountain it would just be a bonus. 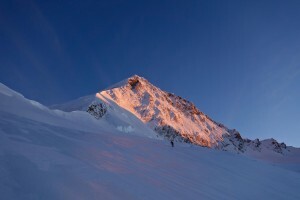 After a warm and long night in Colin’s extra sleeping bag I packed a sled with some extra food and took of towards ABC. 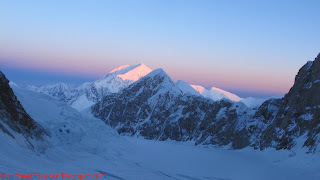 I really wanted to get back to Magnus as soon as possible so we could concentrate on trying to climb the Cassin Ridge. I had done what I came for, but I also wanted Magnus to get his big goal realised. It was the hottest day on the whole trip and I was tired from the last adventure. It took me 5 hours to get to 11000 camp where I brewed up and ate dinner, but then it took another 4 hours to get the last 3000 feet up to ABC. I was tired for sure, but when the sun went down over the mountains it got really cold and windy. 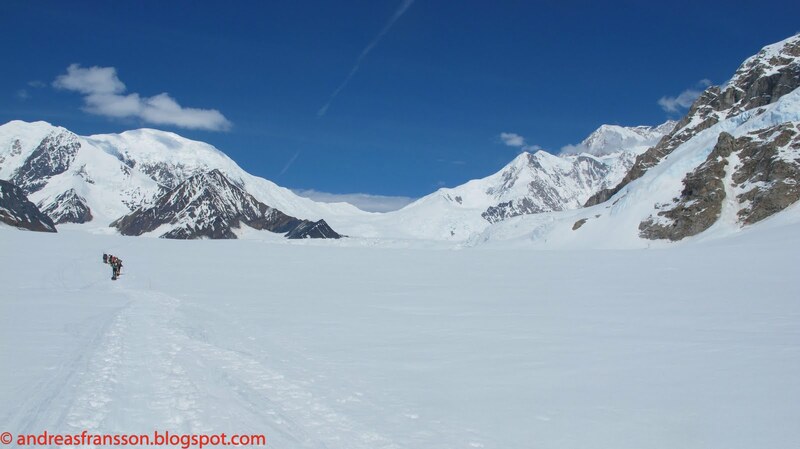 In the end I had all my clothes on and walked as fast as I could but I was still so cold that I could not even put on my ski crampons for the last hills up to camp. 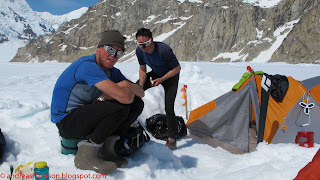 I stumbled in to Will and Jon’s tent late that evening just begging to get warmed up again. 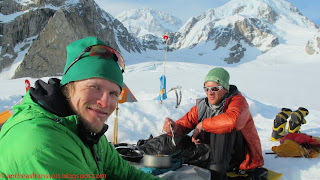 I instantly got handed a few warm water bottles and a sleeping bag and it didn’t take long before I was warm again – Its worth more than anything having good friends on the mountain. That day was for sure my hardest day on the whole trip. I don’t see this descent as a true first descent, more like a great mountain adventure and a challenge and dream lived trough. I’m a challenge driven person more than sensation based ditto and I usually look for adventures where I wont know the outcome or the result. Can an adventure be an adventure if you do know the result? I don’t think so. Skiing big faces one will never know the conditions before one is there trying – and that’s where I think the beauty of skiing, climbing and alpinism lies; in the act of trying to realise a dream. And if you are not accepting the risk of failure that is the thing that’s going to keep you from realise your visions. The skiing on this face was by no means difficult. Its snow, ice and rock like any other face in the world. The challenge was to not get touched by the collective fear that is always built up around something that is not done before as well as having a strategy that will give you the best possible chance of success and survival. Mark Twight’s saying that; “strategy is beyond technique, technique is beyond the tools” always rings true in the mountains. There are three different ways to pass the rock wall a bit more than half way down. 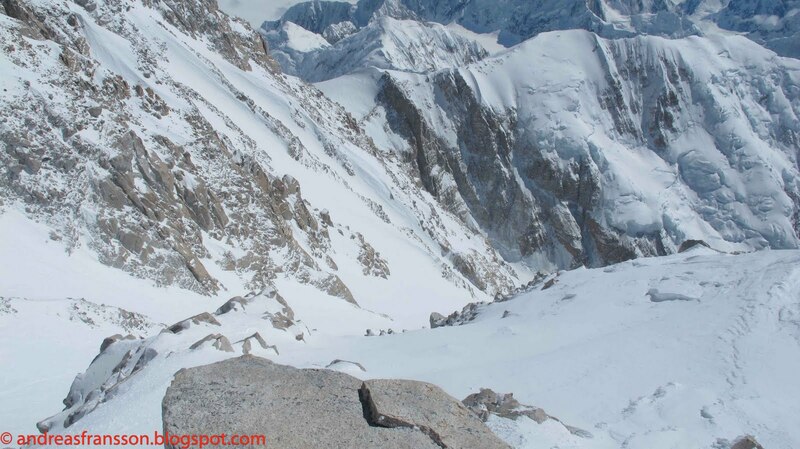 I was aiming from the start to take the far skiers left because I thought the rock rib was going to be possible to negotiate with skis on and that looked like the way to get most skiing in. I took the middle way on my descent because I was already past the rib and the slopes further skiers’ left was much icier. 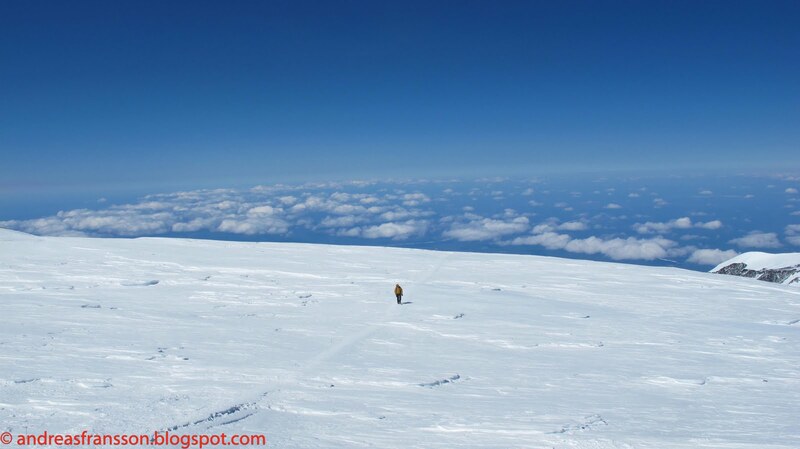 I think that, with the knowledge I have now, I would recommend taking the skies right option that will skip the rib and then follow a ramp after the rappels to get back to the main slopes. 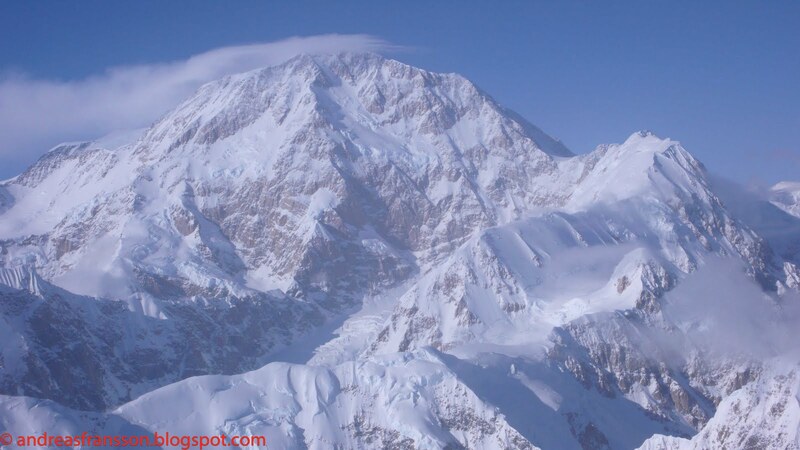 I know two parties who have tried climbing up the face intending to ski it. Dan Corn and a friend climbed halfway before they returned down, also doing some down climbing and rappelling to get down the main slopes. Greg G Collins and a friend also tried it a few years back, but they turned around early because of rock fall. This is definitely one of the best ski descents I can imagine. 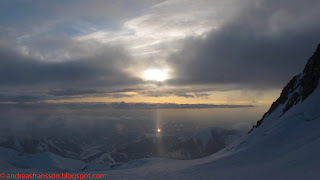 It is huge, it goes from the highest summit in North America, and it offers great skiing potential, some challenging skiing and ski mountaineering and it is a mind game. 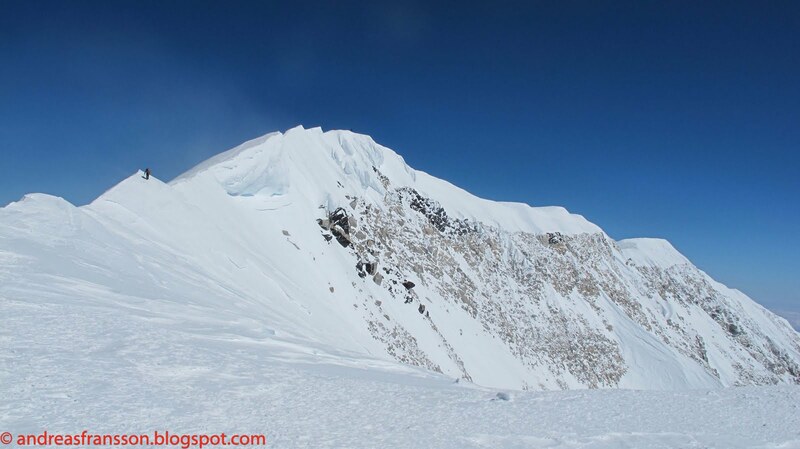 It also demands a good strategy to avoid the objective dangers such as stone fall, bad weather, the cold and avalanches. I would not by any means call this a contrived ski – but an excellent face for really big mountain skiing, with everything that comes along with that. I don’t know what it would take to do a complete descent or even what would be fair to regard as a real descent and the subjectivity of the sport sometimes tires me. I’m happy to give things a try as long as they give me a challenge, beauty and a good adventure – that’s all I’m looking for and then, afterwards, I just want to let them be as they where when I was out there – great adventures. I’m greatly thankful for everything I got to experience on this adventure as well as for the great people I got to meet and hang out with and I’m already immersed in the research for the next quest to come! Mt Foraker in the sun rise. At the end of the descent I didn’t really focus on photos, so this is the first one just before I took of down the glacier.